Over the years I have received many inquires concerning antique furniture manufacturers and furniture prices. Quite a few of these inquiries were looking for free antique furniture appraisals. Please note that I am not an appraiser. Appraisals take time something that I don't have much of to spare with my busy schedule. While some antique furniture can be appraised quickly by simply consulting a reference or antique price guide. 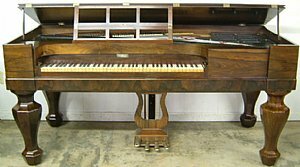 Others pieces such as the R Nunns & Clark Square Grand Piano pictured above. Which I researched for an antique auction consigner several years ago require days of work to arrive at a proper conclusion. Antique furniture prices can vary greatly depending on where you live in the United Sates! Styles that sell quite well in one part of the country may not create much interest in another region! Condition is a also major factor in determining furniture value. Period antique furniture may be valued thousands of dollars higher when it retains it's original finish. A serious scratch or cigarette burn can lower the value of 1920's - 1950's era furniture by several hundred dollars. You have probably heard the saying that "you get what you pay for"? This old saying certainly applies to "free" appraisals! Generally speaking someone offering free appraisals has a motive. In the case of free antique furniture appraisals that person may be looking to buy your furniture for a fraction of it's real value? This is cetainly not the case in every instance. However it's always best to be careful and get a second opinion! So where can you find someone to give you an honest free appraisal? If you are looking to sell your antique furniture a "reputable" auction company may offer free appraisals. However I caution against contacting an auction house with no intent of selling your antique furniture. A recommended antique dealer or collector might offer their "opinion" concerning the value of your antique furniture? In some cases an antique dealer may also be an appraiser? There is a world of free pricing information on the web. Websites that offer antique auction results are a good source of "market" value. Price guides are often used as a source for "retail" values. Retail value is the price you might expect to pay at an antique show or in an antique mall. Appraisals given for "insurance" purposes generally are based on the cost of replacement. Which may be quite a bit higher than retail because of the time and effort required to replace the item. For online antique furniture appraisals I highly highly recommend Whats It Worth To You. I have had hundreds of visitors to this website use their fine antique furniture appraisal services over the years! At $9.95 their online antique furniture appraisals are only a fraction of what most local appraisers charge.